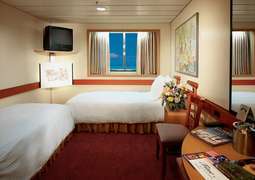 A variety of cabin categories is offered on board the Carnival Fantasy. 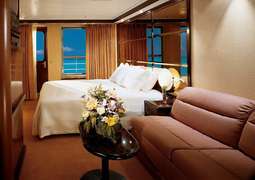 Feel free to choose between inner, outer and balcony cabins, as well as luxury suites. No wish will be left unfulfilled as you relax in your comfortable and stylishly furnished home on the high seas. 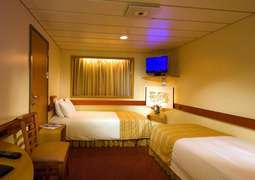 A flatscreen television and 24-hour room service are only two of the special features of all cabins. Culinary highlights are can be found in each of the five restaurants on board. Dine in the elegant ambiance of the À la Carte Restaurant or enjoy a snack in the bistro or 24-hour pizzeria. The sushi bar offers lighter fare and health-conscious guests are welcome to indulge in the Spa Carnival Menus. The Carnival Fantasy offers an unrivalled entertainment programme. Live bands and impressive, Las Vegas-style evening shows are main evening highlights among a variety of other events in bars, clubs and lounges. Try your luck in the casino or spend unforgettable evenings with international artists and comedians that will surely give your laugh muscles a good workout. The Club 02 for teenagers provides fun, music, movies and much more, whereas our younger guests are welcome to play and meet new friends under professional supervision at Camp Carnival. It's easy to keep active on board, as the Carnival Fantasy offers endless sporting activities. The fitness centre is equipped with steppers, bicycles and treadmills, and offers many fitness courses. Practice your swing on the mini-golf course or relax in the sauna, jacuzzi and steam bath. You're also invited to spoil yourself with manicure and massage treatments in the spa area.